Description: The six-pointed star has a circular centre with the GRI/VI monogram, surmounted by a crown and inscribed THE FRANCE AND GERMANY STAR around the foot. 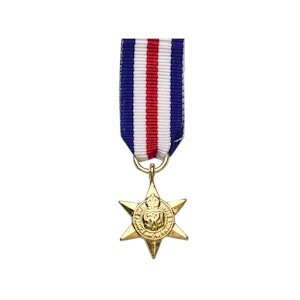 Comments: Awarded for operational service between 6th June 1944 to 8th May 1945 in Belgium, France, the Netherlands or Germany. Service in the English Channel, North Sea and Bay of Biscay in connection with the campaign in Northern Europe also qualified.